Low Sodium Recipes for Meniere’s Disease etc. Vegetarian. 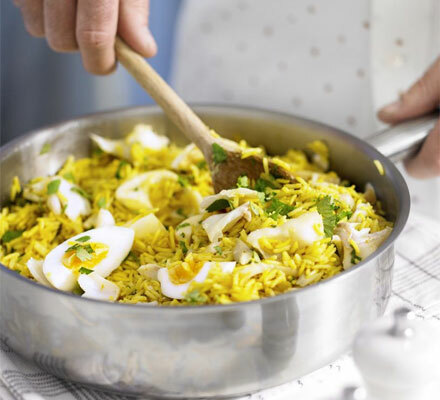 Kedgeree is often eaten as a breakfast food in Britain, although it feels more like a lunch or dinner elsewhere. It’s origins are from British Colonial India. This recipe serves two. Double or triple (etc.) it for more people. 2 cups cooked brown rice (add a little olive oil and lime juice, but no salt when cooking, to give flavor). Do not overcook the rice. Boil two eggs in a pot of water for 8 – 10 minutes. Add the rice to the stir-fry and gently stir it in. Add 1 tablespoon of water, put a lid on the pan, and let the flavors combine for 5 minutes. Peel the eggs and slice them into quarters. Serve the hard-boiled eggs on the rice mixture. A small piece of unsalted butter, or low-sodium mayonnaise can be placed on the eggs just before serving. Photo credit BBC to give an idea to non-British Meniere’s patients.